DePaul recently headed to Albany, New York to advocate on behalf of individuals with mental illness. Led by DePaul Recreation Activities Coordinator Austin Pettigrew, several clients of DePaul programs including Carriage Factory Apartments, Neighborhood of the Arts Apartments, Rochester View Apartments and the community joined a convoy chartered by the Mental Health Association’s Creative Wellness Center. They visited the state’s capital for the New York Association of Psychiatric Rehabilitation Services, Inc. “Get on the Bus” Legislative Day. Attendees were briefed on critical legislative initiatives impacting mental health policies. Following a rally and march on the capital, participants were able to meet with legislators. 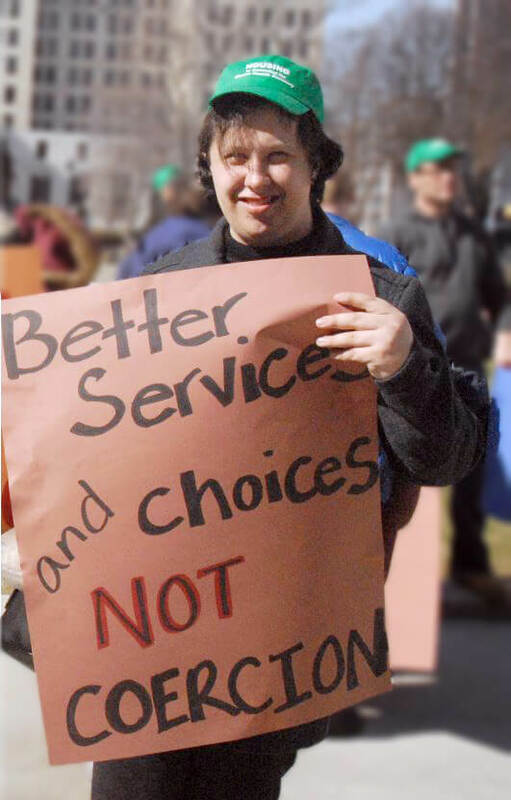 DePaul’s clients spoke out in favor of Governor Andrew Cuomo’s push for an increase in supported housing beds. Deb B. of DePaul’s Carriage Factory Apartments said she felt advocating for increased subsidized housing was important because it has had a positive impact on her life. “They’re giving me the support I need at Carriage Factory Apartments,” she added.